If you regularly use social media sites like Facebook or Twitter, chances are, you have heard about ice bucket challenge. I rarely comment on this kind of social trend, but I do feel this new hype has gone too far now. Almost everyday I would see photos of more people doing the challenge with the media publications are stressing out more on the process of dumping cold water on someone’s head rather than educating people about ALS and why they should donate. Ice bucket challenge was started to promote awareness of the disease amyotrophic lateral sclerosis (ALS) and encourage donations to research. ALS (Amyotrophic lateral sclerosis) is a disease that causes obvious weakness and/or muscle atrophy and most people with this disease will slowly lose their ability to move within months or years. If you want to donate to support the research to cure this disease, you can visit ALS Association website. The “basic” rule of ALS ice bucket challenge is, people challenge each other to dump a bucket of ice-cold water on their heads, or donate to ALS, or both. Anyone doing the challenge can nominate up to 3 other people to do the same (dump water, donate or both) and the challenged has 24 hours to do so. I can perfectly understand if famous people (movie stars, popular singers, top tech executives, national sportsmen and other public figures) do this challenge to raise awareness. Bill Gates, Mark Zuckerberg, Tim Cook, Satya Nadella, Sergey Brin, Larry Page and many other names in tech industry has published videos themselves taking up the challenge. Their videos will be watched by millions of people, thus raising awareness and attract donations. Even though not all of them explicitly mention, I believe most of them also donated to the ALS Association. Now the next question is, how about ordinary people doing the challenge? If an ordinary person is dumping water on top of his head, then upload it in YouTube. How many people are going to watch his video AND donate? 5? 10? Chances are, even this person’s friends would have heard about ALS and the challenge from famous people’s videos by now. So why add the process of wasting water? Many people doing ice bucket challenge lives in developed countries where tap water are safe to drink. Imagine the irony if one day 10,000 people are doing this challenge using drinkable water, then 10,000 buckets of water is thrown away on that day only, while we still have severe drought and drinking water problems in Africa? 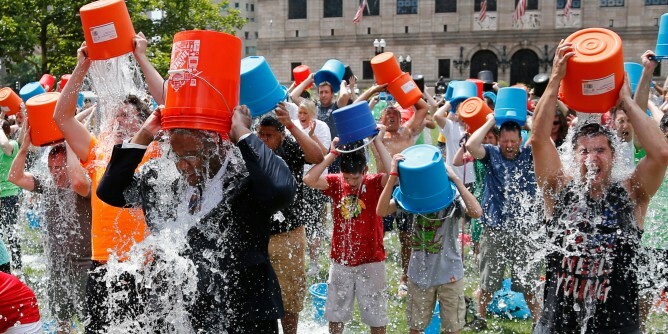 Those buckets of water poured by public figures will raise significant money and will help a lot of people with ALS. For me, that justifies the water usage pretty fair. But ordinary people doing it for the hype? Perhaps we need to start thinking about taking the option to “just donate”. According to water.org, currently 780 million people lack access to clean water, 345 million of them don’t have regular access to any water at all. According to this article, ALS Association estimates that ALS affects 350,000 people worldwide. I am not saying that these 350,000 people are less important in any way. They do deserve the best help and the best research. But wouldn’t it be better if we can give our help without throwing away something that 345 million people can only dream about? I’ve seen videos of a large group of people doing this ice bucket challenge together. Some are even trying to make world’s record on the largest number of people doing the challenge together. At this point, it becomes highly questionable how many of those participants are actually donating some money? More importantly, don’t forget about other charities. 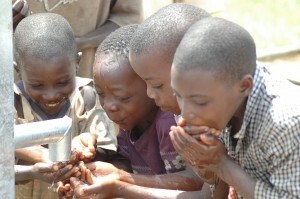 Everyone who has more than their basic needs in life, should always consider to spare some money to help those in needs. Finally, here’s a little bonus. Patrick Stewart shows us how to take on this challenge, the classy way.